If we pick up where the last trip ended, then we would be sitting in the pickup truck, broken down in the pitch-black west Texas night, 18 miles from civilization. But with a new alternator in the old F-150, I was eager to get back out on the rural routes. I could have searched for wild golf adventures in a warmer climate, but truth is I had unfinished business out west. At the very least, I hoped to right the wrongs that made my initial quest for courses off the beaten bath a bit too bumpy. So I was poised for departure, one foot out the door when the wife asked for my itinerary. My what? I printed out a map of far west Texas, circled five courses, and presented it for quick approval. “You failed to apply the laws of physics,” she said. OK, so maybe it’s physically impossible to drive that many miles in three days. But the truck was loaded with camping gear, golf clubs, a bunch of fire wood, and two Christmas trees to burn. I was motivated to prove her wrong but also wondering what to tell the state trooper when I got pulled over for breaking the laws of physics. So, I headed in the general direction of the Big Bend, taking I-20 west. First stop, according to the itinerary, would be San Angelo State Park. I would arrive in time to set up the tent before dark, of course, and in the morning would be within striking distance of a handful of nine-hole layouts. But I woke up in my truck at 3:30 a.m. I was in Abilene State Park. I wasn’t having another nightmare about breaking down in the middle of nowhere. Plans changed, as usual, along the way. It was already dark when I pulled into Abilene and then after finding the park – no easy feat – I was underwhelmed by a quick drive-through. I left the park, contemplated driving to San Angelo (90 miles) over dinner and then returned. I ventured into another area to find heavily wooded site near the creek. With Christmas tree limbs as kindling, my fire blazed quickly, but the strong wind and cold prohibited me from pitching the tent. Staying warm was a chore. I kept adding layers of clothing. I propped my boots near a burning log, walked around to keep blood circulating, and tossed a can of soup in the fire for a quick midnight snack. Resigned to sleeping in my truck – not the first time – I considered staying up all night – not the first time for that either. After all, the wind was howling so hard, the truck was swaying. I was pretty much in the same boat as the month before. But as I reached in the back seat for another sweater, I saw a light peeking through the dense grove of trees. It was the moon, which was flexing its muscles to go full (not lone) wolf in two days. The moon would be a major player the entire trip, keeping the two-lane roads lit and providing even more motivation to avoid the physics police. My goal: To be in Big Bend, with tripod set up, before 11 p.m. in two days (Jan. 21). Just one day in and the itinerary was in tatters. Freed from the shackles of organization, I headed south on US-277 – one of the state’s longest highways – hoping to hit three courses and then retire at San Angelo State Park. About half way to San Angelo, I pulled into Bronte (pronounced Brunt), not knowing that it was named for the English novelist Charlotte Bronte when founded in the late 1880s. Bronte Longhorn Golf Club, formerly known as Singing Winds, was a joy to behold. Seemingly carved on a wheat field, the nine-hole course presents shotmaking challenges. Three holes border Old City Lake. Mature trees place a premium on accuracy. As with almost every nine-holer in this region, small crowned greens and wind are a course’s only line of defense. Eldorado Country Club, located off 277 where it intersects with 190, was next. Part of a park in the old section of town, the fun course features five par-3s. The small greens were in great shape, providing a perfect short-game workout. Although a second set of tees makes for 18 holes, I resisted the urge with one more course to check out. I headed west on US 158 through a maze of oil rigs and farmland to 163 south. 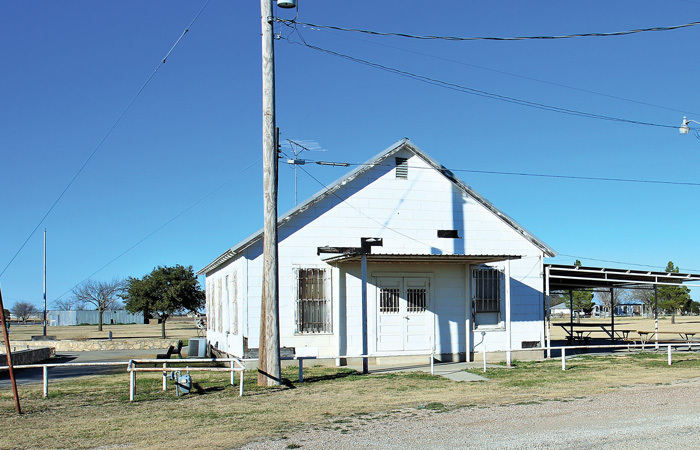 The sun was about to set when I got to Ozona, the “Biggest Little Town in the World.” Six years after its founding, the town of Powell’s Well was changed to Ozona for its open air. Get it? Ozona Country Club, established in 1954, is a semi-private club with a reportedly dwindling membership of about 50. The charming layout was in good shape for the dead of winter. Although I was unable to play the course because of time restraints – good luck setting up tent before dark, right? 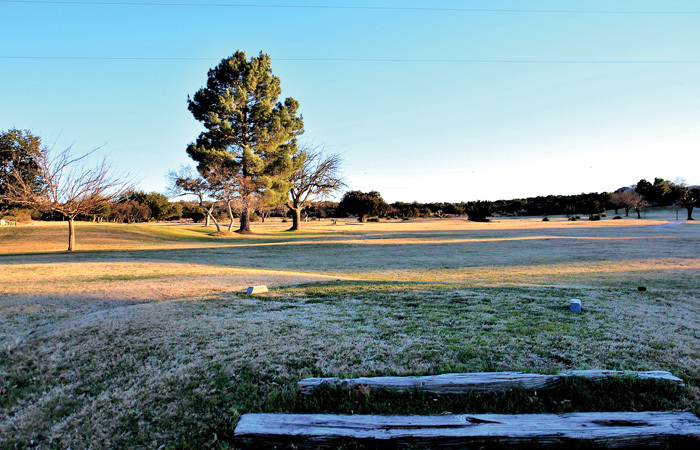 Ozona offers a relatively stern test with mature trees bordering the mostly flat fairways. You’ll also find bunkers – somewhat of a rarity among pasture courses – protecting the Bermuda greens. As I took sunset photos of the first hole, a sweeping par-4, from behind a large clump of swaying native grass, the moon had already announced its arrival, peeping over the trees on the horizon. With my work done for the day, all I had to do was find a place to sleep. I got a cup of coffee and the homemade tamales at the Valero on Main and US-10 and then retraced my steps back north to San Angelo State Park. I pulled into the south section about 9 p.m., befriending the park ranger who arrived as I was stuffing my last $14 of cash in the night envelope. He recommended pitching tent at the farthest point, where 38 campsites front the lake. I had the entire place to myself. The moon was huge, so I had plenty of light to get the tent up. My Christmas tree limbs popped in the roaring fire. Wide awake and a tad over-confident from an entire day without a significant travel problem, I rolled the dice hoping to avoid potential woes. I decided to fill up the truck. Since the park is in a populated area, it took maybe 10 minutes to find a service station. Good news: Cost for unleaded was $1.54, the cheapest I’ve seen in recent memory. More good news: The clerk told me a funny story about how he accidentally locked himself out of the station one night. Ten minutes later, the joke was on me. I pulled up to the park gate only to find it locked. Serious. I flashed the brights, then got out to assessed my situation. Surprisingly, I couldn’t find a YouTube video on breaking into jail. After about 30 minutes of feet stomping and occasional swearing – I found after-hours phone numbers for the three park rangers near the overnight pay envelopes. The ranger seemed to be expecting my call. He told me the numbers to open the padlock. Back at camp, my hot temper was quelled by the frigid lakeside wind. I kept feeding the fire and considered throwing a line for catfish with my hot dog for bait. Instead, I ate the hot dog and went to sleep. I awoke late, and after a breakfast of bacon, eggs and potatoes, realized the laws of physics had a considerable lead on me. Terlingua, my proposed destination, was 312 miles (five hours) away. By the time the truck was packed, it was about 1 p.m., and I realized my wood supply was precariously low. Both Christmas trees were toast. So, on the way out, I threw a few dead tree limbs into the pickup for kindling. The next thing I know, park ranger is in pursuit. He pulled around the corner, emergency lights turned on for emphasis. My young buddy stepped out of the vehicle. I’m pretty sure he lowered his wire-rim sunglasses and straightened his hat on approach. I was laughing. I thought he was joking. Maybe I just didn’t grasp the seriousness of my crime. Was I going to prison for violating the laws of physics? Will my children recognize me when I get out? Do you know who I am? “Do you know why I’m stopping you?” the ranger said. “Uh, not exactly, but if I did something wrong, I didn’t mean to,” I said. I was mum on Newton’s laws of Motion for obvious reasons. After calling in my license, the park ranger returned and explained why it’s illegal to take tree branches from the park. It throws the eco system out of whack, which is understandable. I got off with a warning, this time. And I was still abiding by the law when the truck’s speedometer hit 80 mph on I-10. I was practically flying when I made the turn onto US-67 south, just past Fort Stockton, into the most epic sunset I’ve ever seen. With the lunar eclipse coming in a few hours, the mesas and buttes were awash in a bright orange glow for maybe an hour. Arriving in Alpine about 7 p.m., I began the process of spontaneous lodging. I drove around for almost two hours checking out false leads on parks. And staying at Big Bend National Park, a bucket-list experience, was a no-go because of the government shutdown. After leaving a second campsite that offered only RV camping, I made a wrong turn and found myself in the Sul Ross State University parking lot about 10:30 p.m. A herd of a dozen mule deer emerged from the shadows to check me out. It was then I realized my lack of sleep was catching up to me, so I begrudgingly surrendered to a hotel. I checked in just before midnight and after the lunar eclipse. In the crisp morning, I toured Alpine Country Club. 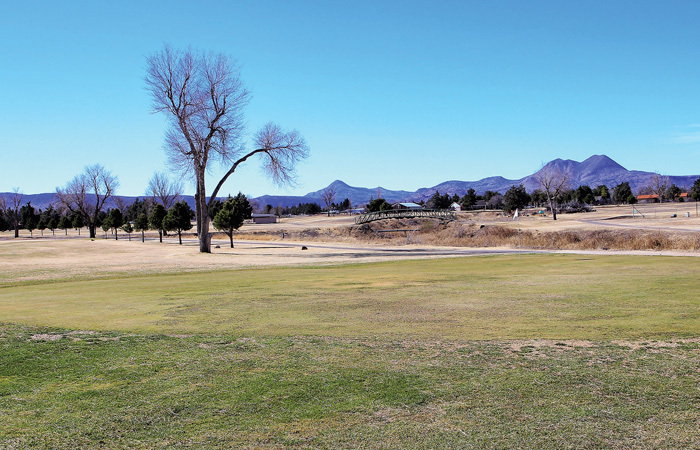 Nearby Marfa also has a quaint nine-hole layout. Both courses have scenic backdrops and can be played in an hour. Alpine CC meanders around a dry creek bed. Trees line many of the fairways. Pins can be hard to reach on the small, finely manicured greens. The conditions of these far west Texas layouts are amazing considering the extreme weather conditions. On my way home, visits to Iraan and Big Lake revealed similarly intriguing layouts that encourage your imagination and shot creativity. Iraan Country Club may be the best of the bunch. Thick groves of pine trees dot the rugged topography and flagsticks bend in the wind on the small undulating greens. Big Lake, another semi-private nine-holer, is tucked between US-67 and the train track. The greens, which sport some dramatic contours, were in terrific shape for late January. As for the undulating greens, they are a mystery to me. I suggest you apply the laws of physics.